Having trouble with making sure all of Marketing leads are followed up on? Do you find it hard to meet your Lead SLA? 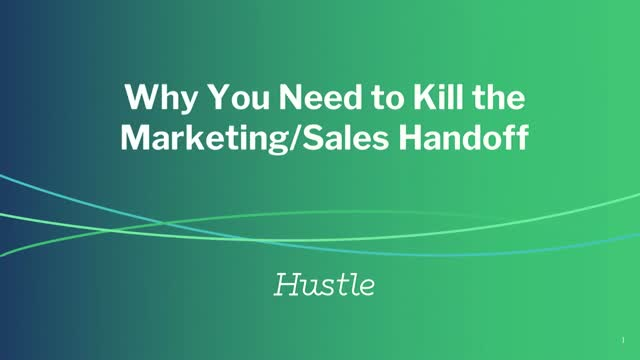 Sales leaders such as yourself often put a lot of pressure on ensuring a smooth handoff between Marketing and Sales teams. Unfortunately, this firm handoff isn't the best experience for your customer. Customer expectations in both B2B and B2C are evolving. They expect consistent communication and conversation at all stages in the buying cycle. Even before entering the Sales cycle, they want their questions answered and concerns addressed. At the same time, response rates for old communication channels are decreasing. Simply engaging customers with Drip emails isn't enough anymore. Both Marketing and Sales need to change the way they operate. Join Hustle leaders Molly Babbington, Director of Sales, and Jonathan Gladbach, Director of Marketing to learn how they ran joint Marketing and Sales campaigns through text message with 85% response rates and 20% conversion rates to meetings. - How to properly use SMS messaging to prospects at the very top of the funnel to quickly qualify leads and create interest. - Ways to avoid disjointed customer experience between marketing campaigns and sales. - Methods to successfully reactivate dead leads with a simple conversation.